Scores in a wider array of stat categories than most fantasy leagues, measuring true team value. 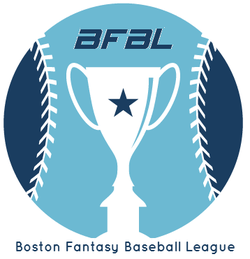 Week one of the 2019 Boston Fantasy Baseball League is officially in the books. Off to the hottest starts are the Reasonable Clout and Clarksville Crushers. The Reasonable Clout, and new manager, Jake E. burst on to the scene taking 14 of the 16 categories, winning the week 14-1 over the Chico's Bail Bonds, catapulting into first place. ​The Clarksville Crushers pulled into a stellar second place position with their own 13-2 victory over the Texas Leaguers. Week 2 will feature these two teams facing off against each other with one game separating them in the standings.